Back in February, we noticed in a teardown for the Google Voice app that support for text messages originally sent via Hangouts was coming to the app. Note, this is for SMS sent over the Google Voice system, not the old Hangouts SMS integration that died last year. Based on recent reports, that feature is now rolling out to a wider audience. We started hearing about the change in functionality as early as mid-April, but there has been an increase in reports recently, so it has likely started rolling out to a wider audience over the last week. 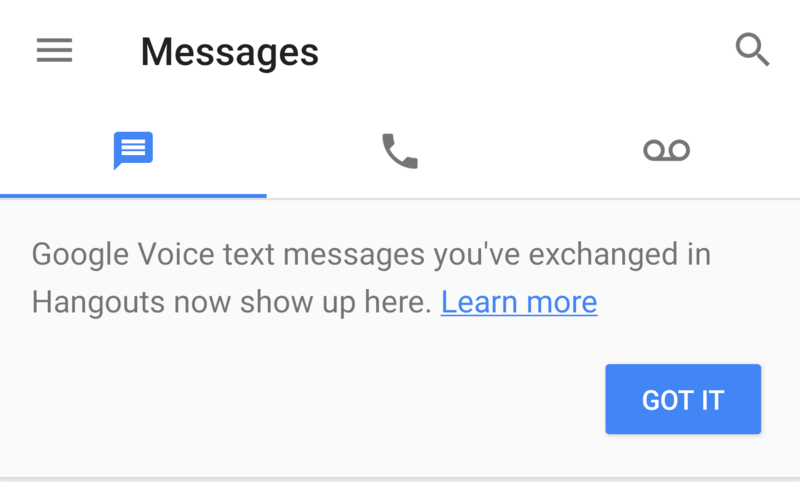 None of us here at AP seem to have it, but the change is marked by a new banner that appears in the Google Voice app, which states that "Google Voice text messages you've exchanged in Hangouts now show up here." Along with the banner comes the obvious described change in functionality: SMS sent and received in Hangouts via Google Voice now appear in the app. By bringing those messages over to your Google Voice history, that's one more nail in the Hangouts coffin.